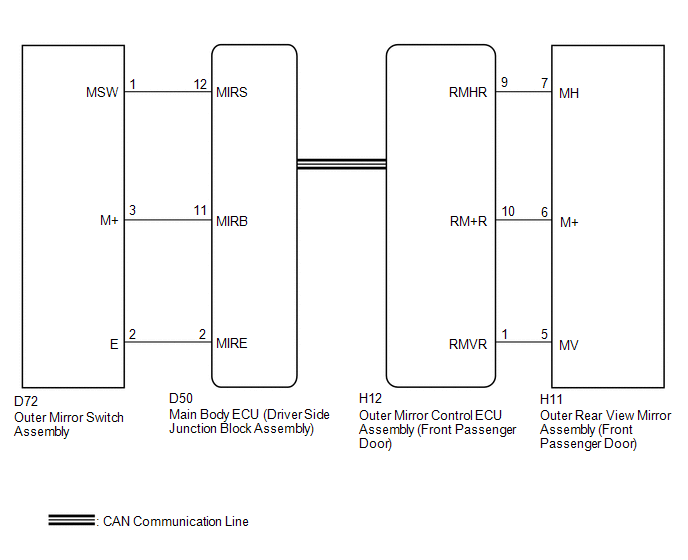 When the mirror adjust switch is operated, the main body ECU (driver side junction block assembly) detects the switch operation and sends the mirror adjust switch signal to the outer mirror control ECU assembly (front passenger door) via CAN communication. On receiving the signal, the outer mirror control ECU assembly (front passenger door) operates the vertical and horizontal mirror motors, which are built into the outer rear view mirror assembly (front passenger door), to adjust the mirror surface position. On the Techstream screen, ON or OFF is displayed for each item according to the table above. (a) Enter the following menus: Body Electrical / Mirror R / Active Test. Operate with ignition switch ON and the vehicle stopped. This test tilts the mirror up or down. This operation can be confirmed by watching the mirror move in the desired direction. This test tilts the mirror right or left. Power mirror operation is normal. (a) Remove the outer rear view mirror assembly (front passenger door) (See page ). 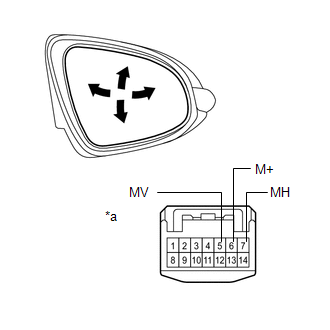 (1) Apply battery voltage and check the operation of the outer rear view mirror assembly (front passenger door). (a) Disconnect the H12 connector from the outer rear view mirror assembly (front passenger door). (b) Disconnect the H11 connector from the outer mirror control ECU assembly (front passenger door). 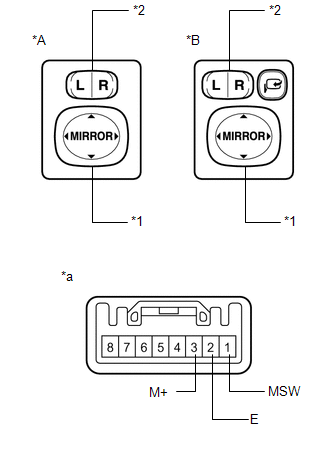 (a) Remove the outer mirror switch assembly (See page ). (a) Disconnect the D72 connector from the outer mirror switch assembly. (b) Disconnect the D50 connector from the main body ECU (driver side junction block assembly).